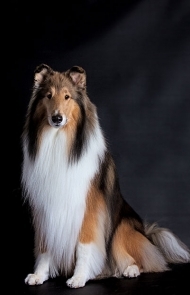 The Collie, also known as the Scottish Collie or the Scotch Collie, is perhaps most famous due to the television series about “Lassie.” There are two varieties of Collie: rough-coated, which is the recognizable long-haired Collie, and smooth-coated, which is becoming increasingly popular. Famous for their loyalty, bravery and kind spirit, the Collie is one of the most glamorous and well-known of all dog breeds. Its name is thought to come from the name of the Scottish black-faced sheep called “Colleys” – the animal that this breed was assigned to watch. The Collie was recognized by the American Kennel Club in 1885, one year after the AKC was established. The Collie Club of America was formed in 1886 and was the second parent club to join the AKC. While the breed certainly has qualities that bolster that impression, it’s a disservice to any dog to load him up with baggage that he can’t possibly carry. The Collie is gentle, affectionate and sensitive, but Collie puppies don’t come fully trained and ready to rescue Timmy from the well. There are two types of Collies. The most common is the Rough Collie, the classic Lassie, with a long coat. The Smooth Collie sports a short, dense and flat coat that has a lot of undercoat. In the show ring they are considered the same breed and are judged by the same standard. Collies love children, love playing with them, and bond closely with all family members. They are not a one-person dog and are protective of everyone in the family. Collies think of everyone as their friend. They are an excellent choice as a family dog and get along with other pets. Be aware that their herding heritage may cause them to nip at heels, which can frighten some children. The Collie will also herd your neighbor's chickens, the neighborhood kids, and other dogs and cats. The Collie is usually quiet unless she has a reason to bark. However, if she is left alone too often or if she is bored, she will bark excessively. Both varieties need grooming, but the Rough Collie especially needs regular brushing to keep her coat clean and free of tangles. Many Collies are sensitive to medications including ivermectin, the drug used in heartworm preventives. Be sure to talk with your veterinarian before giving your Collie a heartworm preventive or any other drug. Be careful from whom you acquire a Collie. The Collie's popularity has given rise to unethical breeders acting with no regard for temperament, health, or conformation. Collies are sensitive and can become depressed if spoken to harshly. Collies don’t have a “doggie odor” as long as they are brushed regularly. Other identifiers: Large and lean, chiseled face, ears never pricked or sticking straight up and always have a folded tip. 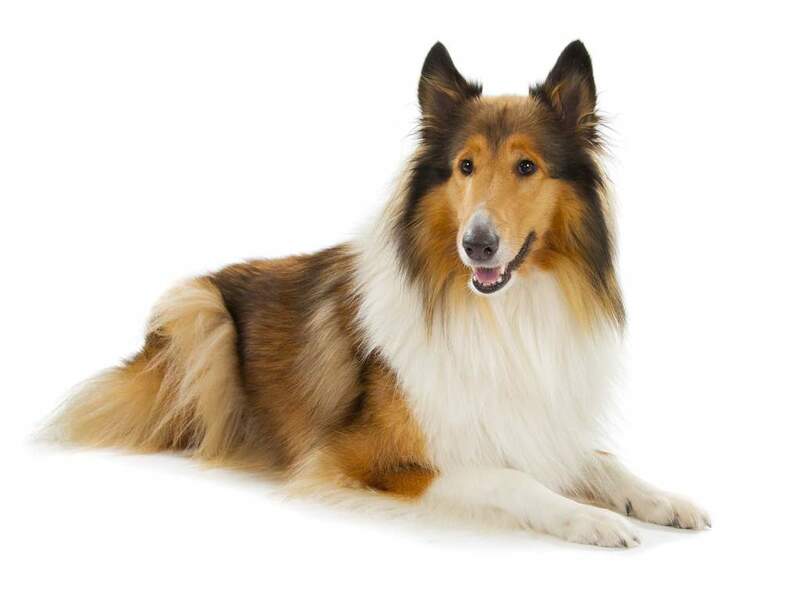 Possible alterations: Some Collies have a smooth coat verses the common rough coat. The ancestors of today’s Collies worked as herding dogs in the Scottish highlands, driving cattle and sheep to the market. They may take their name from a Scottish breed of black-faced sheep called the Colley. Not much is known about their origins, shepherds being more interested in working ability than in keeping pedigrees or studbooks. The Collie might have remained a humble, little-known herding dog, but fate had a different plan. Queen Victoria, who frequently vacationed in Scotland at Balmoral Castle, fell in love with Collies in the 1860s. Royal patronage caused a demand for the breed. They went from being the helpmeets of humble shepherds to the cherished companions of the wealthy. By 1877, Collies were being exhibited at the Westminster Kennel Club show, and they again were taken up by wealthy dog lovers, including J. P. Morgan. In 1886, two years after the American Kennel Club was created, the Collie Club of America became the second parent club to join the AKC. 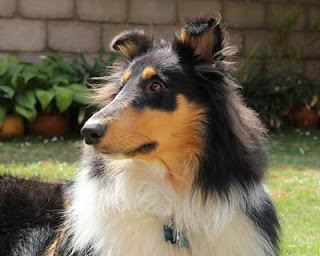 The Collie has been a main character, and appeared as a perfect family dog, in such books as Albert Payson Terhune's "Lad of Sunnybank" and Eric Knight's “Lassie Come Home." 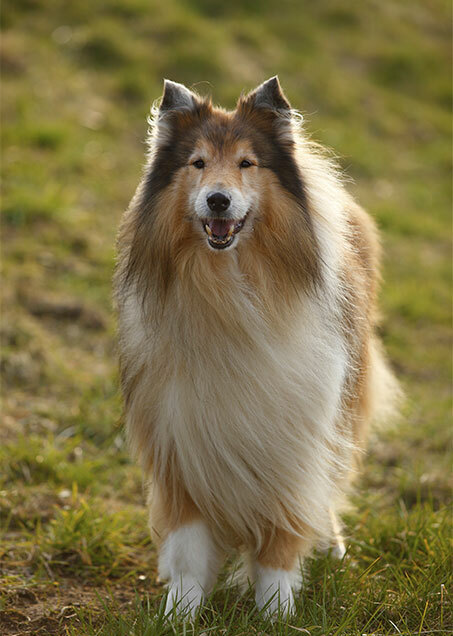 The Collie’s popularity leapt to its greatest heights during the nearly two-decade run of the television show “Lassie,” which aired from 1954 to 1973. 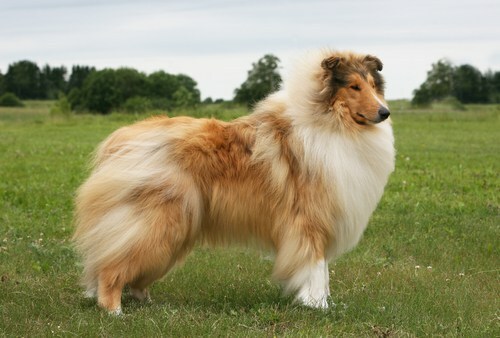 The series captured the fancy of the American public, and the Rough Collie because widely known and loved. Today, the Collie ranks 38th among the breeds registered by the American Kennel Club. Just about anyone who has been around since the advent of television knows who Lassie is. She is the loyal, intelligent, fearless star of TV and movies and we've been following her adventures for the last sixty years. Lassie is an excellent ambassador for the entire Collie breed, as they are just as intelligent and loyal as the silver screen portrays. Collies are fantastic family dogs, they love to be with people and are highly patient and loving with children. 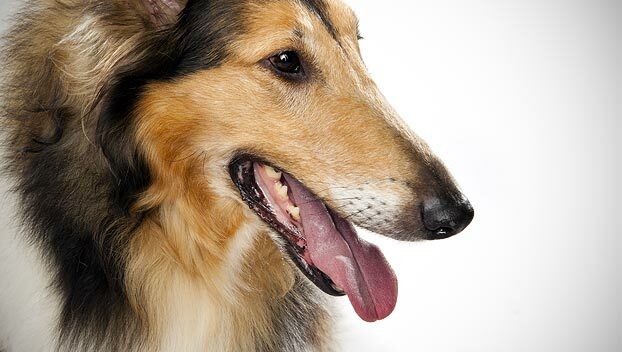 The Collie has a few health concerns you should be aware of. Collies are prone to eye ailments such as Progressive Retinal Atrophy. This means it’s important to keep regular appointments with the vet for eye checkups, so that problems can be identified before they become too serious. This breed can also be affected by Neutropenia , gastric torsion, hip dysplasia , dermatomyositis and arthritis. Like all breeds, Collies can be susceptible to disease because of trauma, infections, and abnormalities of the immune system, genetic influences or degenerative conditions. The Collie lives comfortably in the city or the country, as long as she has enough exercise. A brisk, daily walk and yard play are sufficient. Mostly, she wants to be with her family, meaning she is not a candidate for a backyard lifestyle. If left alone for too long, she tends to bark excessively. While some barking is normal in this herding breed — that's how she warned the shepherd of wolves — she will bark her head off when she's bored, lonely, or otherwise frustrated. Excessive barking can be avoided by letting the Collie join in all family activities, and by keeping her mentally challenged with ongoing obedience training or dog sports. Training the Collie is a breeze, but — like any dog — she needs early socialization to prevent her from becoming timid. She also benefits from obedience training; a "Quiet" command should be a part of every Collie's training program. The Collie will dog okay in an apartment as long as it is sufficiently exercised. They are relatively inactive indoors and do best with at least an average-sized yard. Sensitive to the heat. Provide plenty of shade and fresh water in warm weather. Collies are easy to train, though sometimes they can be stubborn. They should always be treated gently, with positive reinforcement and treats. Collies are sensitive animals, and when treated harshly they can become timid and skittish. After mastering basic obedience, Collies should be allowed to move on to more advanced training or participate in agility activities. Collies are highly intelligent and have been used as service dogs, guard dogs and search and rescue dogs. To maintain its strong and lean physique, Collies need a lot of exercise. To keep your dog in peak physical and mental condition, be sure to play, take your dog for long walks and give it plenty of activity every day. Rough Collies will need to be brushed at least twice a week to maintain the proper texture and appearance of the coat. Smooth Collies, however, only need to be brushed once per week to remove loose and dead hair. They require a bath every six to eight weeks, and most owners prefer to hire a groomer to do this, as the thick hair of the Rough Collie can be challenging to handle. New owners may wish to consult a groomer or breeder for instruction on brushing and bathing. In addition to brushing and bathing, ear cleaning and teeth cleaning should be part of a Collie's grooming regimen. Check ears weekly for signs of infection or irritation, and use only a veterinarian-approved cleanser on the ears. Regular brushing of the teeth prevents bad breath and tartar buildup which can lead to gum disease and tooth loss. The playful Collie is known for her love of children, even those she wasn't raised with. She's highly protective of the kids in her family, watching over them and keeping them safe from danger, just like Lassie did for Timmy. The Collie is also protective of and gentle with other pets in her family. She's an affectionate, tender guardian, willing to watch over baby rabbits, chicks, or goats. Is the Collie the Right Breed for you? High Maintenance: Grooming should be performed often to keep the dog's coat in good shape. Occasional trimming or stripping needed. Constant and Seasonal Shedding: Routine brushing will help. Be prepared to vacuum often! Easy Training: The Collie is known to listen to commands and obey its owner. Expect fewer repetitions when training this breed. These dogs love and live for a working lifestyle. Whether it is mental or physical stimulation, the Collie needs to keep occupied. A family that has time to dedicate to proper exercise and training would be best fit for a loving Collie. Due to its complex double coat, daily grooming is a must to prevent discomfort and tangles, as well as ease the amount of constant shedding. Collies love kids and make excellent guard dogs; however, as natural-born herders, they may develop tendencies to herd younger family members and should therefore be socialized early on. The TV show “Lassie” made the Collie - and the phrase “Timmy fell into the well!”-famous. 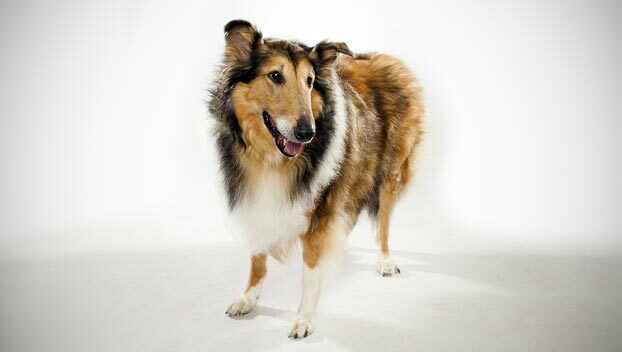 Lassie rescued Timmy from falls into mine shafts, rivers and quicksand. However, during the show’s 19 year run, Timmy never once fell into a well. Silverton Bobbie, the Wonder Dog who in 1923, traveled 2,800 miles from Indiana back home to Silverton, Oregon. 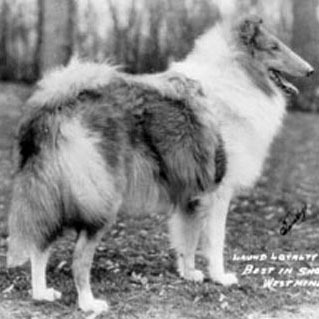 Lad, pet of Albert Payson Terhune. He is chronicled through several short stories, most famously in the collection Lad, A Dog. 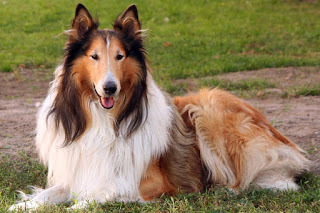 Lassie was a fictional Rough Collie dog character created by Eric Knight who originally was featured in a short story expanded to novel length called Lassie Come-Home. The character then went on to star in numerous MGM movies, a long running classic TV series, and various remakes/spinoffs/revivals. Bessy, a long-running Belgian comics series which also was very successful in French, German and Swedish translations. It also featured a collie, obviously based on Lassie, but in a Wild West setting. Fly and Rex, herding dogs of the movie, Babe. Colleen, a female collie in Road Rovers. Shadow, collie from Enid Blyton's book Shadow the Sheepdog. The collie type is not identified in the text, but the illustrations in an early edition look vaguely like a border collie. Fly, the sheep dog featured in Arthur Waterhouse's "Fells" trilogy for children, Raiders of the Fells (1948), Rogues of the Fells (1951), and Fly of the Fells (1957). The collie type is not specified, but the illustrations look rather like a rough collie.